This 1987 volume brought together for the first time a range of essays on the anthropology of food in Oceania and Southeast Asia. 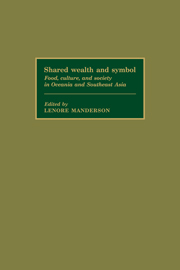 The essays reflect research in the field, primarily that undertaken by Australian scholars. The volume focuses on four main concerns: factors that influence the production of food and dietary behaviour; the way in which people think and speak about diet and nutrition, including concepts of hunger and the classification of foods; infant feeding practice, including the promotion of bottle feeding; and the roles of government agencies and multinational corporations. The regional focus of the volume also allows for discussion of common trends, especially those that have arisen as a result of societies in the region having been incorporated into the world economy. Applicable elsewhere in the world, the volume offers a basis for a comparative analysis of food in culture and society.